It is not uncommon to find that the backboard on a Vienna Regulator case has warped. The challenge with the back of a clock case is that one side is veneered, the other isn’t. The veneered side is then sealed with shellac, so it really doesn’t shrink much with time. But, the back of the backboard is raw wood – which dries out and shrinks. So, the differential contraction causes the backboard to warp. The challenge with the back of a clock case is that one side is veneered, the other isn’t. The veneered side is then sealed with shellac, so it really doesn’t shrink much with time. But, the back of the backboard is raw wood – which dries out and shrinks. The differential contraction causes the backboard to warp. 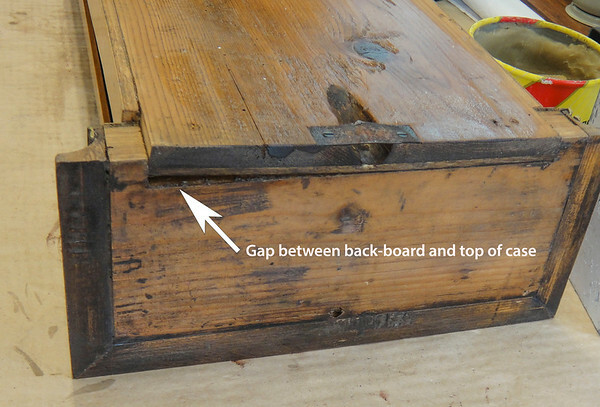 This tidbit includes a video showing how I prepare the back board for being flattened as it is glued back in place. This picture shows how the backboard has split from the top of the case, taking the back side rail with it.